Invest some extra time to think about what you really want and make a detailed list of wishes that will be satisfied at as many stores as necessary. Don’t neglect this step, as there is a real scenario in which you end up with a pile of household goods that don’t actually mirror your (and your spouse’s) personality. Make sure you have the big picture in your mind at every stage of preparing your wedding gift registry. We’re definitely not suggesting that you put your cutlery preferences in your wedding invitation, but, if there is something that really matters to you, like a bigger item such as a couch or a TV system, you can always put it in the wedding gift registry and let (at least) your closest friends and family know that they can group and get you the one thing you need instead of spending their money on many things you don’t need. So, you’ve registered at a few online stores as well as a few local stores and you think your part is done. Well, it’s not! The most important step is still ahead – make sure your guests know where to look for (otherwise all your efforts will end up being made in vain). 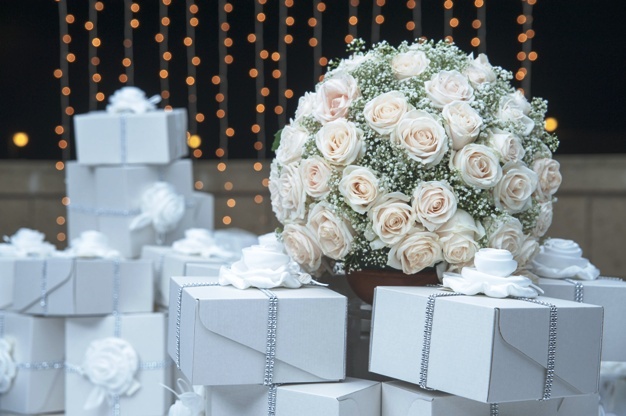 You have a few options, but the best one is to include all the details about your wedding gift registry in your website and make sure all your guests have a link to it and know where to look for. Wedding gifts are no longer just about china sets and food processors. Go the extra mile and include some activities in your wedding gift registry as well. Whether it is a romantic evening with exotic meals and champagne on your first honeymoon night or a spa procedure for couples, there will always be guests who think outside of the box and will be thrilled to get you an experience you’ll remember for many years to come!